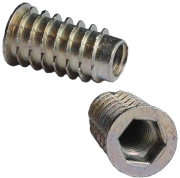 Threaded inserts made from high quality zinc alloy and designed to provide a permanent thread in wood, chipboard and composite materials. 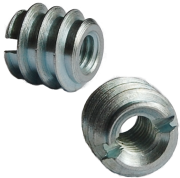 Screw in threaded insert without sealing flange to allow bottoming out. 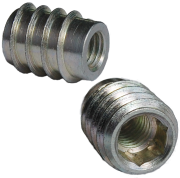 The unique self tapping external thread design provides excellent resistance to torsion and vibration pull out. 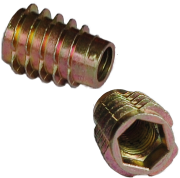 Finished with an industry standard corrosion resistant coating, either yellow zinc plate or RoSH compliant zinc and clear.